"Anzac Day marks the anniversary of the first campaign that led to major casualties for Australian and New Zealand forces during the First World War. The acronym ANZAC stands for Australian and New Zealand Army Corps, whose soldiers were known as Anzacs. 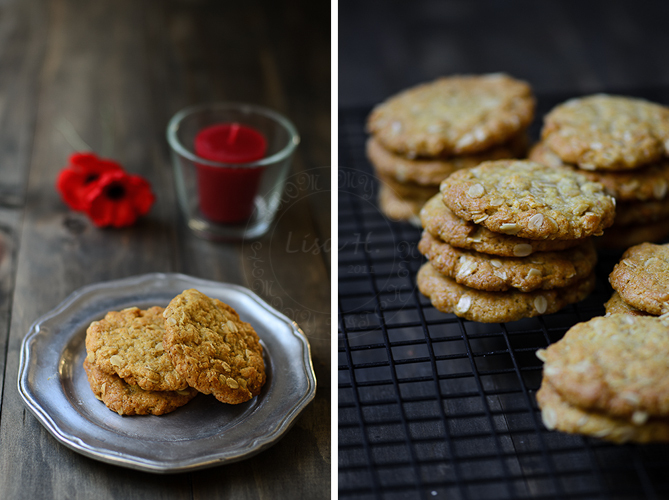 Anzac Day remains one of the most important national occasions of both Australia and New Zealand, a rare instance of two sovereign countries not only sharing the same remembrance day, but making reference to both countries in its name"
and ANZAC biscuits were introduced during those difficult time. "Anzac was first used in a recipe, published in an advertisement in the 7th edition of St Andrew's Cookery Book (Dunedin, 1915). It meant to be a cake, not a biscuit, and there were no mixing instructions. 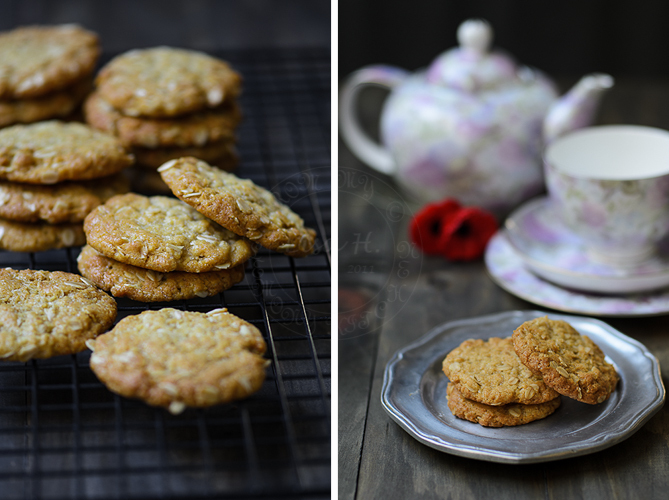 A recipe for "Anzac Biscuits" appeared in the War Chest Cookery Book (Sydney, 1917) known as Rolled Oats Biscuits. The combination of the name Anzac and the recipe now associated with it first appeared in the 9th edition of St Andrew's Cookery Book (Dunedin, 1921) under the name "Anzac Crispies". 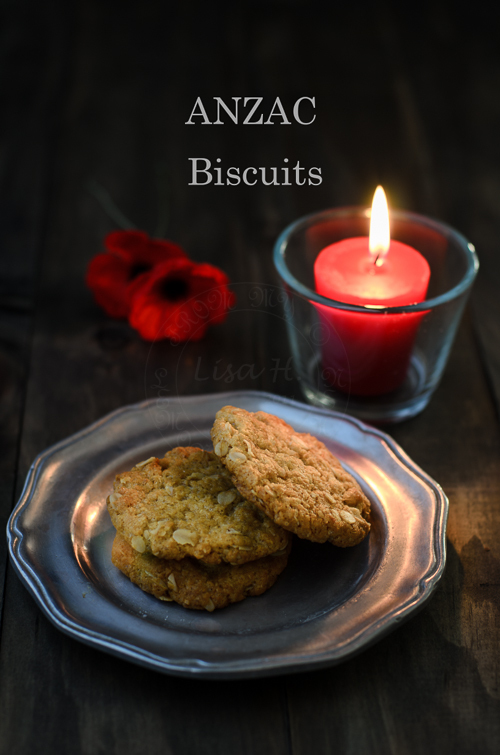 Subsequent editions renamed this - Anzac Biscuits"
I once bought ANZAC biscuits from the supermarket, some 8 or 9 years ago. I was curious but never again I would put the store-bought ANZAC biscuits in my mouth again. I found it too overly sweet. This year, I decided to bake my own. I made it with less sugar and I pan roasted desiccated coconut for that extra nutty flavour. Will I be making them again next year? Pan roast desiccated coconut until golden in colour. Set aside to cool. In a large bowl mix all the dry ingredients together (except bicarbonate soda). Use a medium size saucepan and melt butter with corn syrup. Take off from heat and add bicarbonate soda (caution this will froth). Add 2 tablespoon boiling water. Pour the butter mixture into the oat mixture. Roll into walnut size ball and flatten. Place 5cm apart on the baking tray. If baking 2 trays at a time...best to rotate trays between shelves. Bake until the cookies are golden brown. Leave them to cool on the tray for few minutes before transferring to the cooling rack. Love to get my hands on this one day. Love cookies with oats inside. These cookies look so good Lisa...cannot go wrong with coconut and oats...yum! I love oatmeal cookies! These look awesome, Lisa. I've never been that keen on store-bought Anzac biscuits either. I'll have to try your home-made recipe! I'm so glad you told the story of these cookies. Sometimes the story is half of what makes a food good.